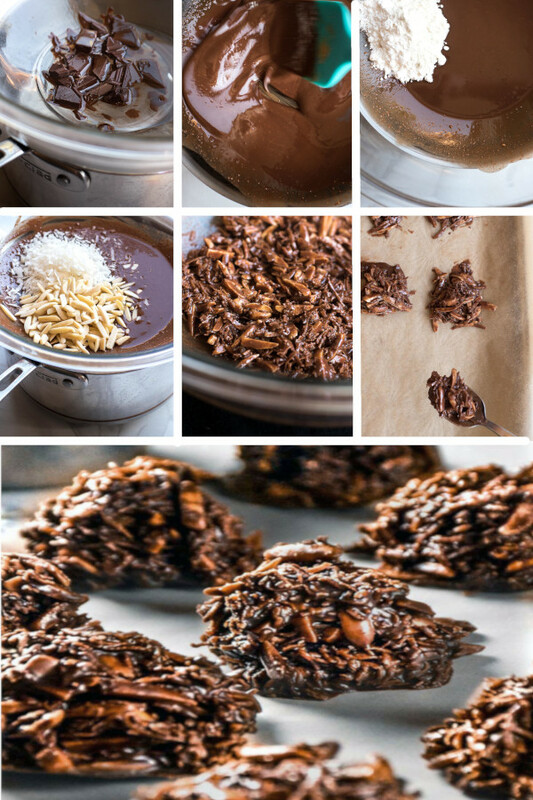 Low Carb No Bake Cookies — Your New FAVORITE dessert! Almonds, coconut and nut butter are the winning trio incorporated into my unbeatable low carb chocolate base for a perfect harmony of tastes and textures. 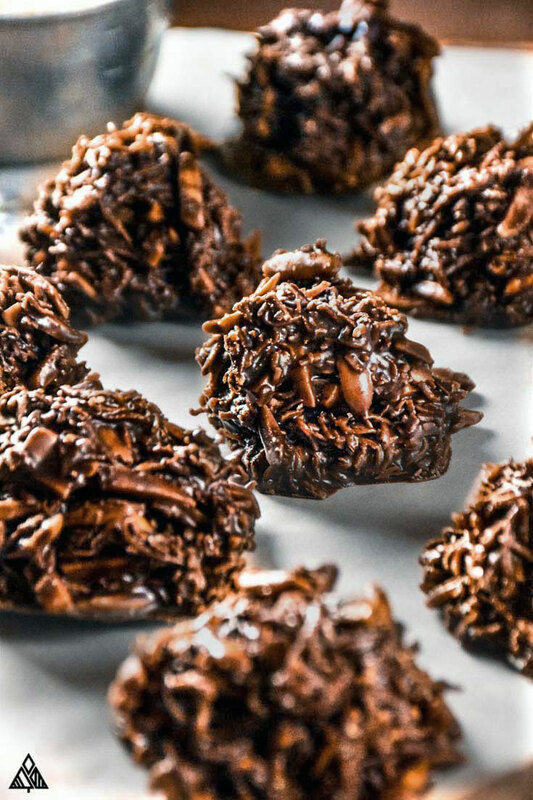 These crispy, crunchy, and smooth low carb no bake cookies may remind you of the coconut haystacks grandma used to make, while others consider them more akin to an updated take on a classic truffle—either way they’re one of my favorite low carb recipes I know you wont be able to get enough of! Give these bad girls a try, and you’ll happily throw your worthless-carb-laden pre-made cookie mixes right in the trash! I can’t wait to share this family’s favorite recipe with you! 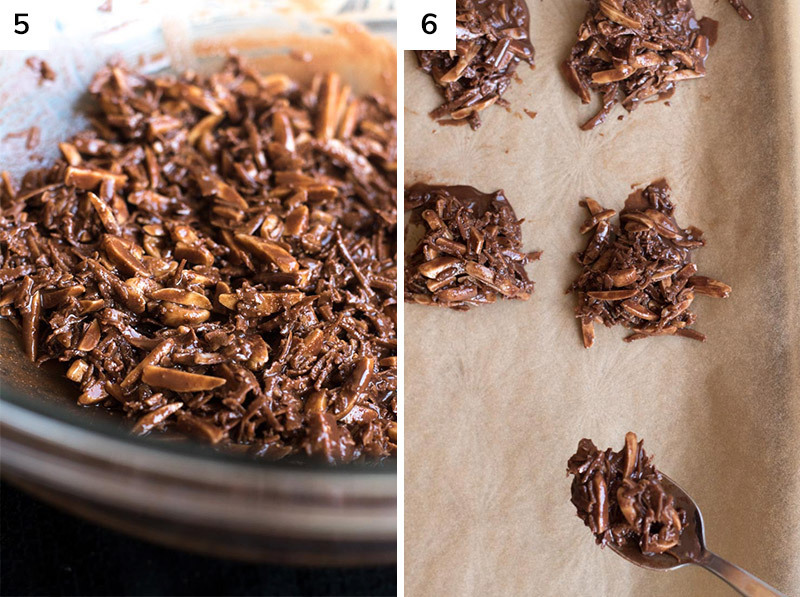 Traditionally, no bake cookies are made with: chow mein noodles and/or oats and chocolate chips—not the sugar free kind. The variations are endless, with loads of trouble-maker ingredients like sugar filled peanut butter, marshmallows, butterscotch chips, sweetened coconut, and candies. One of traditional no bake cookie will rack in about 19g of carbs, 18 of which are pure sugar. Yuck! There’s no need for all that nonsense! How to Make No Bake Cookies, The Low Carb Way! The only tricky part of how to make no bake cookies the low carb way is knowing which ingredients to use—based on what tastes the best and what actually belongs on a low carb food list. Not to fear, I’ve got you covered. Sadly, there are a whole heck-of-a-lot-of carbs in chocolate. My low carb chocolate recipe is the base for these cookies, with one minor change: I swap cocoa butter for coconut oil—it’s easier to come by, less expensive, and melts more quickly. The nuts and nut better lend a satisfying taste and texture in lieu of cocoa butter. That said, if cocoa butter is all you have, go for it! 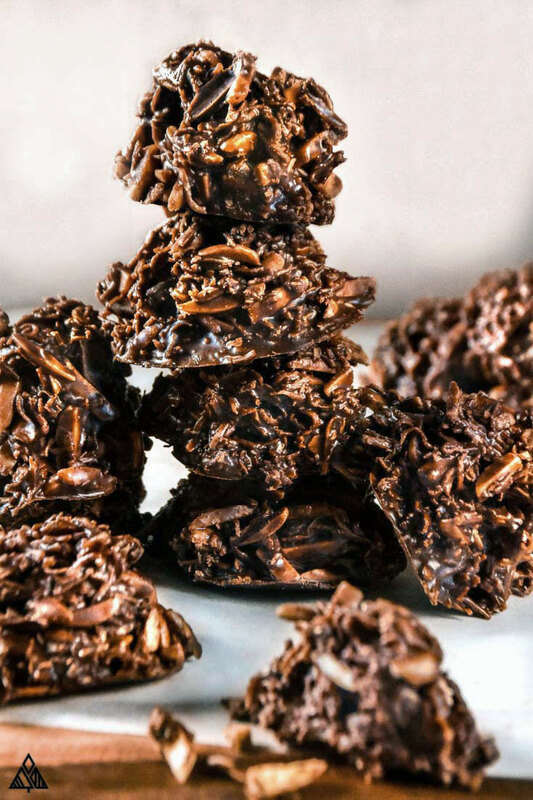 You’ll love these low carb no bake cookies either way. Alternatively, you can make these cookies with sugar free white chocolate, oh yum! This will require a few extra ingredients, but it’ll be well worth it! Check out my recipe to get started. Meet Swerve confectioners sugar—made from erythritol. Swerve is almost impossible to find in a good old brick-and-mortar store, so go straight to our good friend Amazon to find this sweet deal. If you haven’t heard of erythritol, you’ve definitely heard of stevia—both have pros and cons. Both are far superior for us low carb-ers than table sugar or fructose. I find most people prefer the taste of erythritol vs stevia. Erythritol is similar to sugar in many ways with one minor difference—you may notice a slight tingling or cooling sensation (like you do when you eat something minty) in the back of your through when you eat it. I use stevia, however don’t love the taste as much—stevia no bake cookies are not my first pick for this keto recipe for no bake cookies. If you’re worried about consuming erythritol, here’s a little more information on it! 1/4 cup of shredded, unsweetened coconut has 133 calories, 5.33 grams of carbs, 2.7 of which are fiber. If no bake cookies with coconut aren’t for you, you can substitute coconut for extra nuts! Low carb no bake cookies without coconut are a delicious way to add a variety of nuts into this low carb candy. Peanut butter is a lifesaver for keto cookies because of its rich, creamy texture and binding properties. However, many products have quite a bit of added sugar. A quality low carb peanut butter will have a maximum of three, easy-to-read ingredients: nuts, oil, and salt. I love Trader Joes’ Peanut Butter! The good stuff tastes better too, I promise! 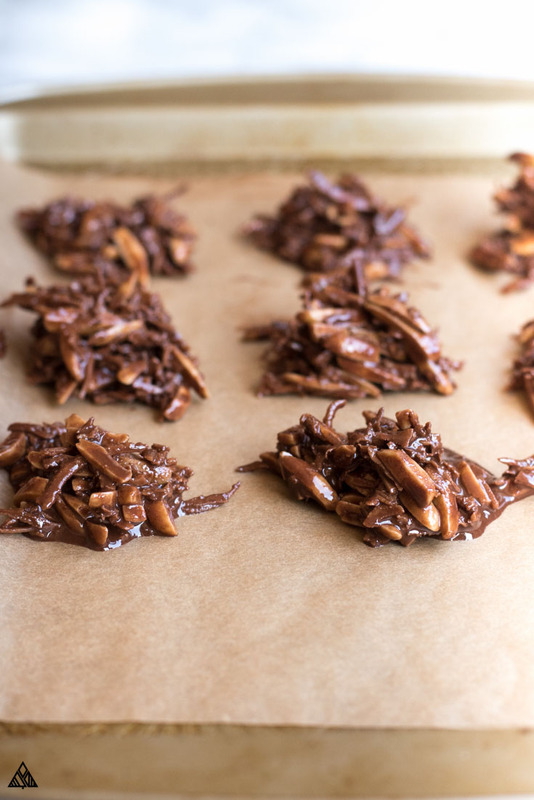 These low carb no bake cookies call for almonds, which aren’t the lowest carb nut. These low carb cookies are just the tip of the health-conscious iceberg: be sure to try low carb almond flour cookies, low carb chocolate oatmeal cookies, and sugar free no bake chocolate oatmeal cookies in order to really pick a favorite healthy alternative. As many of us know, falling off the wagon is too easy to do. So, arm your low carb eating plan with a treat every once and a while! And you’ve got easy no bake cookies you can store and savor all week! Low carb doesn’t mean low flavor! You can treat yourself to this amazing keto no bake cookies recipe, with a low carb ingredient makeover. 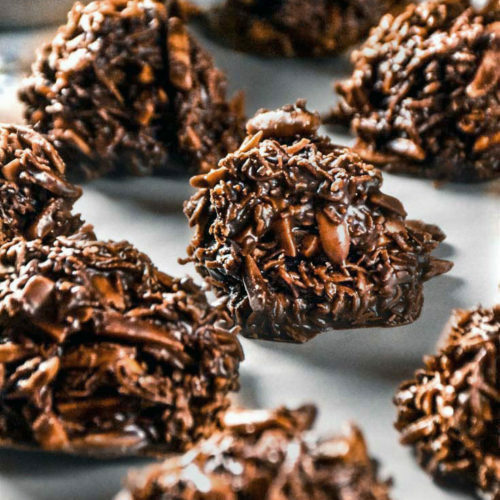 Low carb no bake cookies are the tasty, peanut butter-y, coconut-y confections you didn’t even know you needed right now! Follow our super simple recipe for your new favorite sugar free treat. 2 Tablespoons Peanut Butter can use whatever nut/seed butter you have. 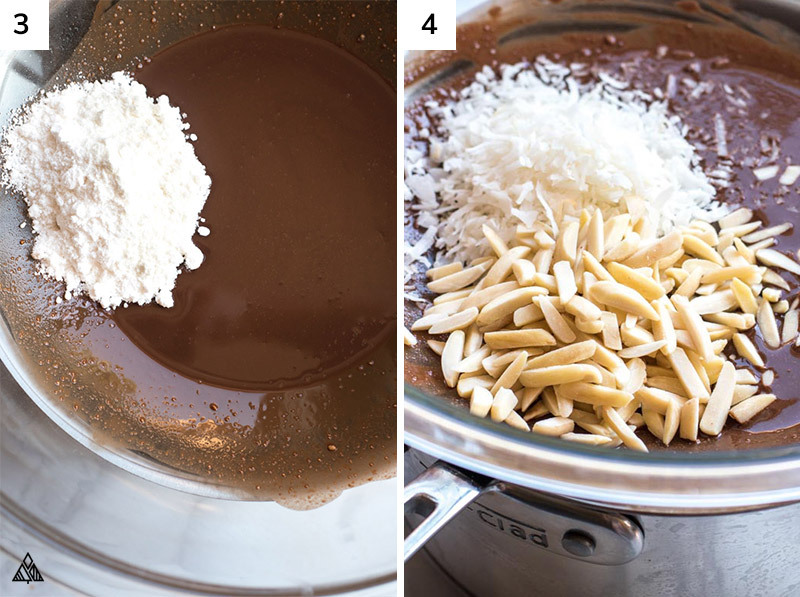 Using a double boiler, melt the coconut oil and baking chocolate together. Stir until these ingredients are both fully melted and combined. Add peanut butter. Stir until combined. Remove from heat and add sweetener. 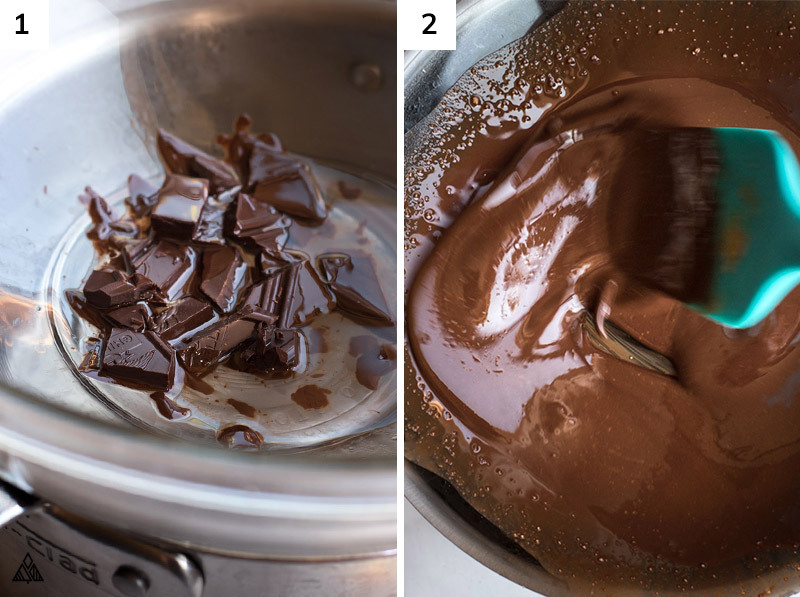 Stir until combined — I find this is easiest to do with a whisk. Stir in salt and vanilla until incorporated. Add shredded coconut and almond slivers. Stir using a spatula to combine. Prep a baking sheet with parchment paper. Using a spoon, create a mound for each cookies, based on your desired size. Place cookies in fridge until they harden and enjoy! The bulk of the carbs in this recipe come from the Erythritol. I also find using a heat safe spatula is the best way to get everything out of the bowl. You can use food grade cocoa butter instead of coconut oil (it has a higher melting temp which is good if you live in a warm place!). I chose not to because coconut oil is more accessible than cocoa butter. Whether you’re vegan, vegetarian, or just a low carber, you may have noticed how hard it is to find low carb vegetarian recipes. So if you’re in the market, this recipe just so happens to be for low carb and vegan no bake cookies. From low carb chocolate, to low carb macaroons, to low carb chocolate chip cookies: chances are, if you’re missing it, there are fabulous low carb desserts recipes for it. Be sure to check out my tried-and-true low carb food list whenever you need a little inspiration! Do you ship your cookes? I’d Love a dozen…..wait, make it 2 dozen! Love all this info for good low-carb ingredient swaps. Thanks! I made these cookie and will be making them again. they are delicious. I have only had to diet a few times in my life. But now that I am retired I find it is a must. These cookies, candy really, are the best I have ever tasted.